Tian Lu is a quiet young woman with bright eyes and a winning smile—until the conversation moves to her family. That family has been shattered, and Ms. Tian has fled to the United States from China to try to rescue her husband and the lawyer who sought to help them. Known to her friends as Lu Lu, Ms. Tian has suffered imprisonment and torture; her husband and the lawyer who tried to defend him have been imprisoned and tortured; and her grandmother, her husband’s mother, and her husband’s grandfather have died prematurely due to worry over her and her husband, Lu Lu says. Lu Lu and her husband both practice Falun Gong, also known as Falun Dafa, a spiritual discipline that involves doing meditative exercises and living according to moral teachings based on the principles of truthfulness, compassion, and tolerance. The popularity of Falun Gong in China led the Chinese Communist Party (CCP) in 1999 to begin a campaign to “eradicate” the practice. Even so, Lu Lu decided to begin practicing Falun Gong in 2005. 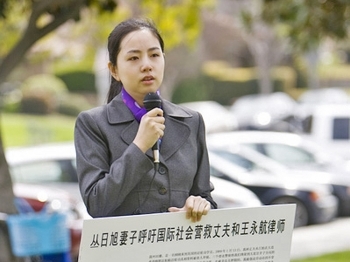 “I was drawn to the principles of Falun Gong and especially to the kindness of Falun Gong practitioners,” she said. She and her husband, Cong Rixu, felt they had a responsibility to tell others about the persecution and about Falun Gong. China’s state-run media does not report on the persecution, it only carries what human rights organizations have called the state’s hate propaganda against Falun Gong. 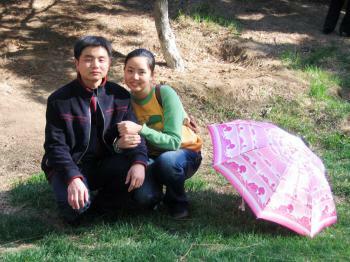 The couple believes that the key to ending the persecution is to educate the Chinese people. Only the Chinese people’s ignorance about Falun Gong and about the CCP’s campaign against Falun Gong allows the persecution to continue, they believe. One of the ways Lulu and Rixu educated their fellow Chinese was to post fliers. On Jan. 13, 2009, they posted a banner that said, “Falun Dafa is Good” on a wall in their hometown of Dalian, and three plainclothes policemen arrested them. When Rixu’s mother, Ms. Zhang Xiucheng, heard the news of her son’s arrest, she passed out and went into shock, only regaining consciousness in the hospital emergency room. The city of Dalian is in Liaoning Province, which, according to the Falun Dafa Information Center, is one of the deadliest places in China to be a Falun Gong practitioner. Lulu recalls the last glimpse she had of Rixu, in the Dalian Detention Center. Police were circling around him and beating him. In his court testimony, Rixu described how on March 2 the police took his picture and finger prints—he had refused to cooperate. “An officer kicked me in the lower back and slapped my face over and over again. He then banged my head against the wall several times, kicked me to the ground, and trampled my body, head, chest, and lower back. My nose and mouth bled, the entire right side of my head was swollen, and my lower lip was open and swollen as well. Then four officers lifted me to the table and took my fingerprints." Lu Lu spent 31 days in jail during which she suffered constant abuse. She went on a hunger strike, losing 20 pounds from her small and slim frame. Eventually she was released on Feb. 12. Her husband was not so lucky. He was held for trial. Saturday's press briefing has been cancelled after too many hard questions about China's human rights abuses.